Antonio Torres "La Suprema" 1864 FE 19 style Classical Guitar: It's Completed and For Sale! 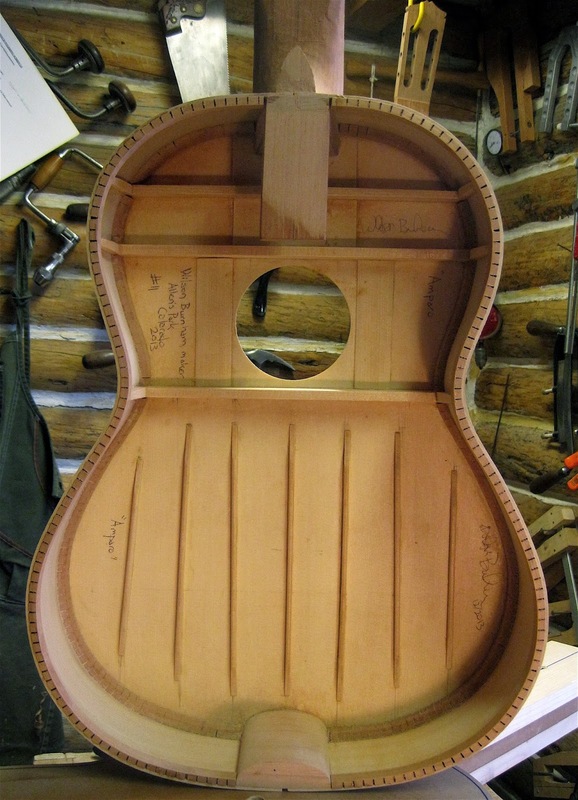 Torres assembled his guitars face down on the solera, having the plantilla of the guitar already cut to shape. I recently finished a guitar that is based upon Antonio Torres's guitar FE 19, aka "La Suprema", which he constructed in 1864. Click here to see the plans that I used to make this guitar. It has an Engelmann spruce top, California laurel back and sides, Spanish cedar neck, an Macassar ebony fret board, ebony binding and is French polished. The string length is 650mm, width of the neck at the nut is 51.5mm and 62mm at the 12th fret. I did not use the standard Torres style of "fan" or "kite" bracing on the guitar's top, instead I used a parallel bracing that Santos Hernandez used on several of his guitars. This bracing helps give the guitar a very beautiful, singing voice that is quite loud, its volume is more than adequate for a concert guitar. Another change from the original guitar that I made was not to install a brass"tornavoz". Click here to learn more about this device. "This is yet another wood that reminds me of maple in appearance and working properties, though its' texture is a bit coarser. Its basic straw color is often flavored with an amazing array of colors and figure, most frequently a maple-ish fiddleback. Myrtle has a reputation for instability that I have yet to experience. Tonewood suppliers occasionally stock sets of myrtle, but if you can resaw, the specialty lumber people like Lewis Judy can give you a better deal on this West Coast wood. This is first-class stuff, worthy of the best instruments." This is not a flamenco blanca guitar, but a classical guitar. I firmly believe that the laurel back and sides add much to the voice of this guitar. The price of this guitar is $2500. I will post sound clips and video as soon as I can. If you have any questions please feel free to contact me at highcountrylutherie@gmail.com.